earlier this week ‘under the same roof’ an exhibition by OKAY studio collective opened at the aram gallery. designers included shay alkalay, tomas alonso, mathias hahn, peter marigold, yael mer, oscar narud, hiroko shitatori and jorre van ast curated by daniel charny. the exhibition explores OKAY studio’s different approaches to design and how their collaboration is possible under the same roof. hung from the ceiling of the gallery is an installation of drawings, sketch models and failed projects from each of the members. 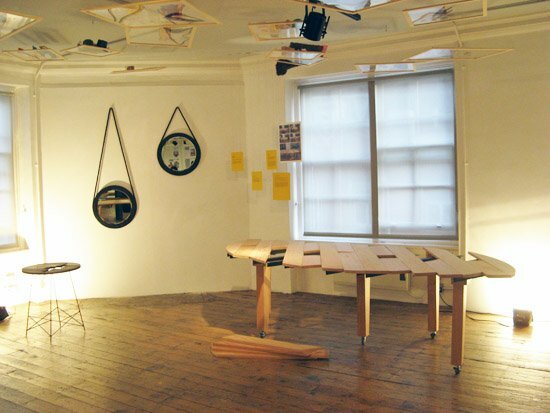 peter marigold displayed two new tables and a series of mirrors made from wood. his ‘ellipse’ kitchen table expands from small kitchen size to a 3 meter dining size. the table is made from off cuts of the ellipse, that can be removed when they are not in use. ‘under the same roof ‘ will be held until november 8, 2008.